Yesterday Twitter launched Vine, a video social network for iOS. Shortly after launch it was discovered that the built-in friend finder feature is not compatible with Facebook. Social networks denying access to user data is nothing new; months after Instagram was acquired by Facebook, Twitter blocked the photo-sharing app from using its own friend-finding API. Shortly after, Tumblr was also blocked by Twitter. Facebook is not playing friendly either. 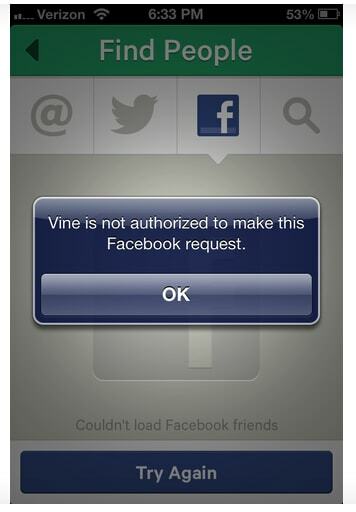 When users try to search for Facebook friends with Vine, the following error message pops up: "Vine is not authorized to make this Facebook request." Facebook has yet to release a statement on the matter.